Poultry holds the middle ground in the eating-of-animal-flesh debate. It’s better for you than beef, but not as good for you as seafood. • It’s easier to lower the fat level in chicken or turkey than in beef. The most important thing you can do to get less saturated fat from your bird is to remove the skin, since most of the fat is found here rather than marbled through the bird’s muscle. Removing the skin from the poultry reduces the calories by at least 20 percent and the fat by 40-50 percent, but it does not significantly change cholesterol levels. • Choose white meat over dark meat if avoiding fat is your goal. Compared with white meat, dark meat is approximately 25 percent higher in calories and over twice as high in fat. Dark meat is also slightly higher in cholesterol. White chicken meat is nearly twice as high in niacin. 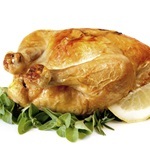 Dark chicken meat offers two-to-three times as much zinc and iron as white meat. • Poultry safety. One problem with poultry is how chickens are raised and fed. At least in theory, free-roaming chickens (listed on menus and labels as “free-range” chickens) produce healthier eggs, at least if they are depending on the chicken feed. If, as studies have shown, free-range chickens produce healthier eggs, perhaps we could assume the meat of free-range chickens is also more nutritious. Common sense would tell us that a healthier chicken who is outdoors in the fresh air and sunshine would be better to eat than one that has spent its short, sad life penned up in a cage unable to roam and search for natural food.